Love Locks – quaint tradition or pollution? Padlocks, thousands of them, on a bridge in Wroclaw, Poland in the spring of 2013. Spreading pollution or cute devotion? There are varied explanations for the origin of love padlocks. In Europe, love padlocks started appearing in the early 2000s. [ The reasons love padlocks started to appear vary between locations, and in many instances are unsourced. However, in Rome, the ritual of affixing love padlocks to the bridge Ponte Milvio can be attributed to the book I Want You by Italian author Federico Moccia, who later made it into the film-adaptation Ho voglia di te. Similarly, an attribution for the bridge Most Ljubavi (lit. 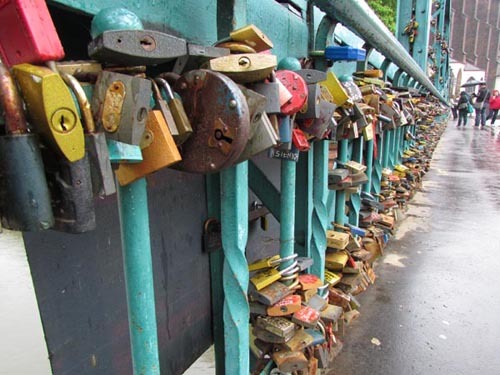 the Bridge of Love—now named after the love padlocks) in Serbia exists, where they can be traced to even before World War II. A local schoolmistress named Nada, who was from Vrnjačka Banja, fell in love with a Serbian officer named Relja. After they committed to each other Relja went to war in Greece where he fell in love with a local woman from Corfu. As a consequence, Relja and Nada broke off their engagement. Nada never recovered from that devastating blow, and after some time she died due to heartbreak from her unfortunate love. As young girls from Vrnjačka Banja wanted to protect their own loves, they started writing down their names, together with the names of their loved ones, on padlocks and affixing them to the railings of the bridge where Nada and Relja used to meet. In Paris Town Hall in May 2010 expressed concern over the growing number of love-locks on the Pont des Arts, Passerelle Léopold-Sédar-Senghor and the Pont de l’Archevêché bridges, stating: “they raise problems for the preservation of our architectural heritage”. The lovelocks of the Pont des Arts mysteriously disappeared during the night of 11 May 2010, but the Administration denied responsibility, until it was discovered that they had been removed by a student of the nearby École des Beaux-Arts to make a sculpture. Love locks immediately began appearing on the Pont de l’Archevêché. Deutsche Bahn threatened to have the locks removed from the Hohenzollern Bridge in Cologne. Deutsche Bahn is the bridge’s operator, but in the end relented in the face of public opposition. In Canada love padlocks appearing along the Wild Pacific Trail in Ucluelet on Vancouver Island, have caused some division as the locks are considered a distraction from nature by some. Love padlocks were removed from the Humber Bridge in Toronto due to concerns over aesthetics and structural concerns if the Bridge were to become a love padlock destination. In Florence, Italy, 5,500 love padlocks affixed to the Ponte Vecchio bridge were removed by the city council. According to the council the padlocks both pose an aesthetic problem as well as scratch and dent the metal of the bridge. In Dublin, Ireland, padlocks on the Ha’penny Bridge, River Liffey were being taken down by Dublin City Council in early 2012. The padlocks could damage the protected structure, the Council has said. “This seems to have only started happening in the last few months and we’re asking people not to do it,” said a spokesperson for Dublin City Council. Some locks have also been removed from the Millennium Bridge, close to the Ha’penny Bridge in the city center, the Council said. The padlocks have been criticized for being an eyesore on public structures. They can also cause further damage when they have to be removed, the Council said. The spokesperson confirmed that the Council will continue to remove the locks from any bridges they appear on in the city center. In Bamberg, Germany, after inviting the public to attach love locks on the Kettenbrücke in 2011, officials threatened to remove them during the same year due to rust. After public outrage and several township meetings, the locks remain. In Fengyuan, Taiwan love padlocks affixed to an overpass at the city’s train station are often affixed in pairs. These locks are known as “wish locks” and local legend holds that the magnetic field generated by trains passing underneath will cause energy to accumulate in the locks and fulfill the wishes. Posted in Europe Tours and tagged bridges, europe, locks, love, padlocks.